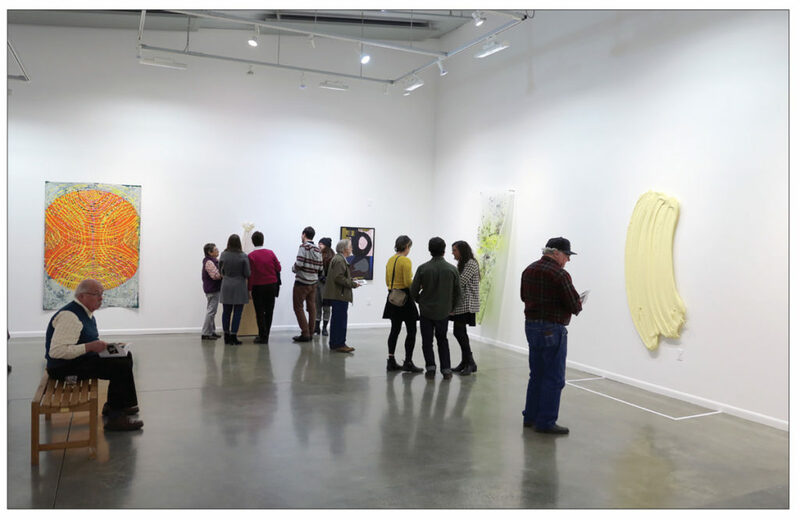 The doors of the Sam and Adele Golden Gallery opened on April 9th for the 4th annual Made in Paint exhibition, highlighting the works of last year’s artists-in-residence. Over 300 people attended the opening night with many more visitors stopping by to see the exhibition before it came down in August. Several of the artists came back for the opening as well as past residents. Made in Paint is about color, acrylic objects, and paint on surfaces ranging from canvas, linen and hand woven fabric, to aluminum, paper, panel, and tarp. Paint has been poured, sewn, piped, and layered, depicting portraits, but also with a more contemporary feel, using lines, shapes, and symbols, along with the more traditional use of the materials. Each year, The Golden Foundation provides a unique 4 week residency program for over 20 artists, providing opportunities to explore modern technology and to experiment with the latest materials, all while continuing a tradition which has spanned thousands of years…painting. Viewers can learn about the 2015 artists and more, by visiting www.goldenfoundation.org. A catalog is available by contacting Emma Golden at contact@goldenfoundation.org. This program is made possible with public funds administered by the Chenango Arts Council, and is made possible by the New York State Council on the Arts (NYSCA) with support from Governor Andrew M. Cuomo and the NYS Legislature.